I don’t know about you guys, but I HATE water. Like, seriously loathe it. It has taken me every ounce of self control to cut soda out of my everyday life and replace it with water. It’s also taken about 5 years to actually do it. (Yes, I already know I am crazy. Yes, I ask myself why I do it everyday. Blame my sister). Obviously, most of us already know about all of the great benefits that water offers, but there’s still just something so boring and plain about it. 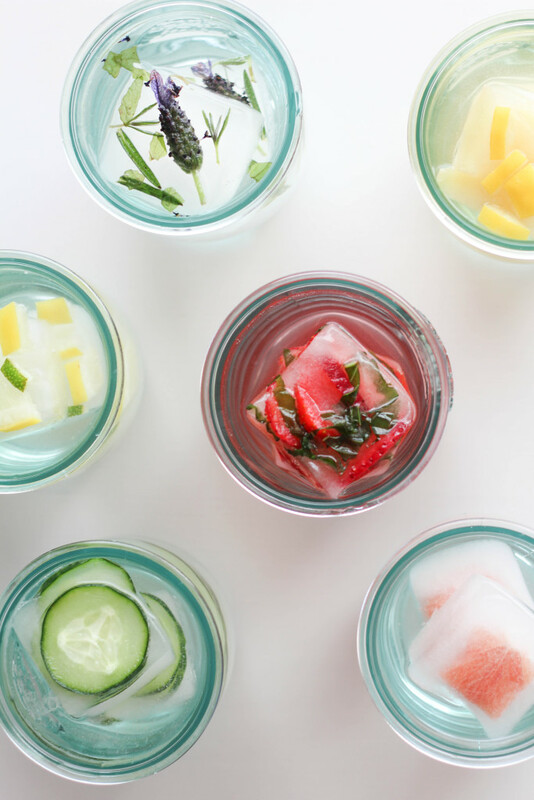 Because I have quite a bit of experience with camouflaging my water now and also because warmer temps are right around the corner, I thought I’d share some easy ways to dress up your glass of H2O with easy flavored ice cubes! 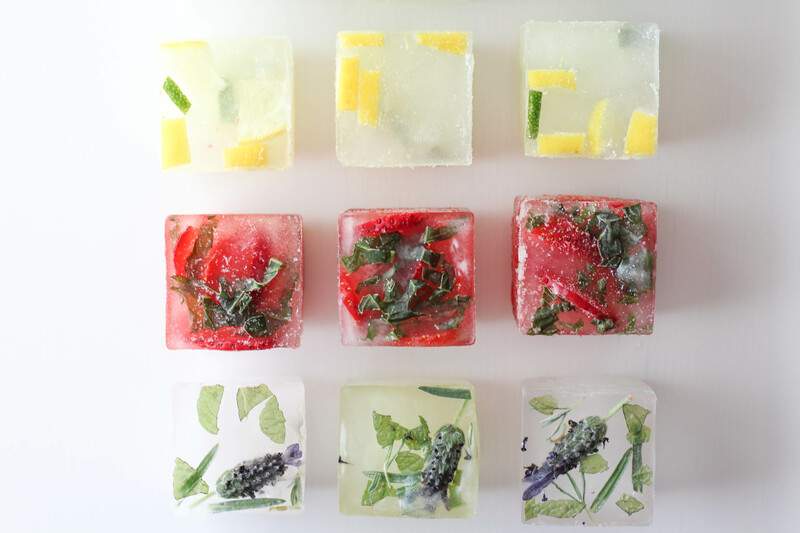 Tell me your guests wouldn’t be impressed when you hand them a glass filled with these pretty cubes! The first step is the water. If you want a really pretty ice cube, and want to be able to see through it, you’ll want to use filtered water. Boil it first, let it cool completely, and then boil and let it cool completely again. I wasn’t that patient when I made these beauties, but they still turned out really pretty, despite my lack of patience. I really love large ice cubes. (I used this extra large ice cube tray. The silicone is perfect for popping these cubes out too!) They last longer in your drinks and you only need a few cubes to fill a glass. 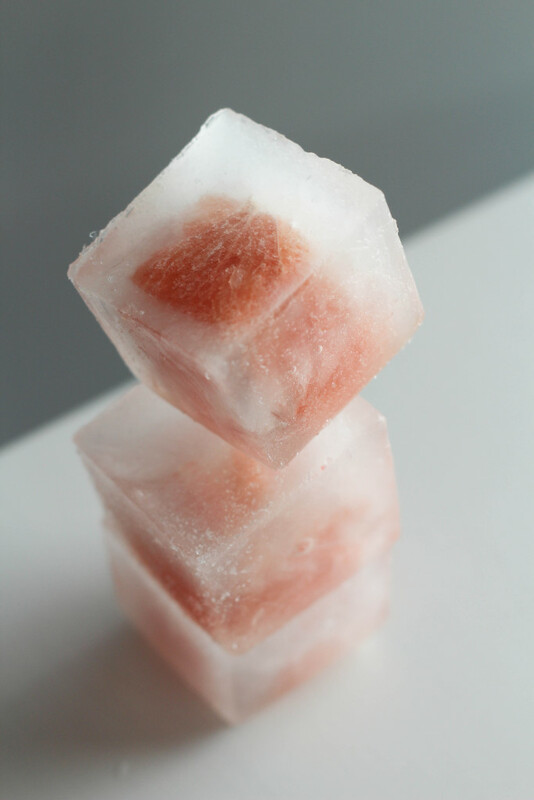 If you choose to make larger cubes, keep in mind that they will take longer to freeze! 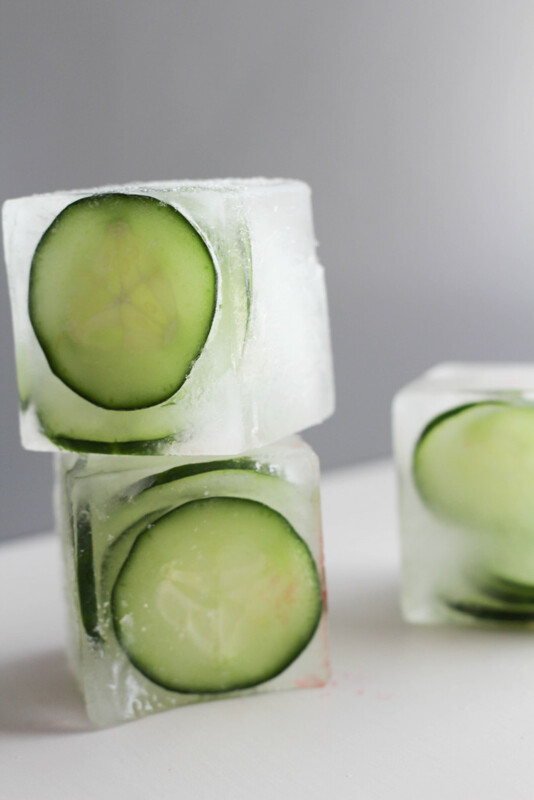 Simply slice the cucumber into thin slices and freeze! It you want to add a bit of flair, you could shave the cucumber skin into tendrils too. Lemon, ginger, and green tea sure do make a pretty little cube. The combo helps with digestion, an upset stomach, and it also happens to be delish. Instead of using filtered water, I froze the lemon wedges and ginger slice in green tea. If you want a cube of health…this is your best friend. Grapefruit is just pretty. The pink citrus fruit looks great in ice cubes too and adds a citrus punch to your water. I cut it into wedges that were small enough to fit into each cube on my tray and then squeezed a bit of the juice in there too for added flavor. When the ice melts in your glass, this little wedge will look gorg! Lemon and lime go together like peanut butter and jelly. This classic citrus combo makes for some tasty water too! 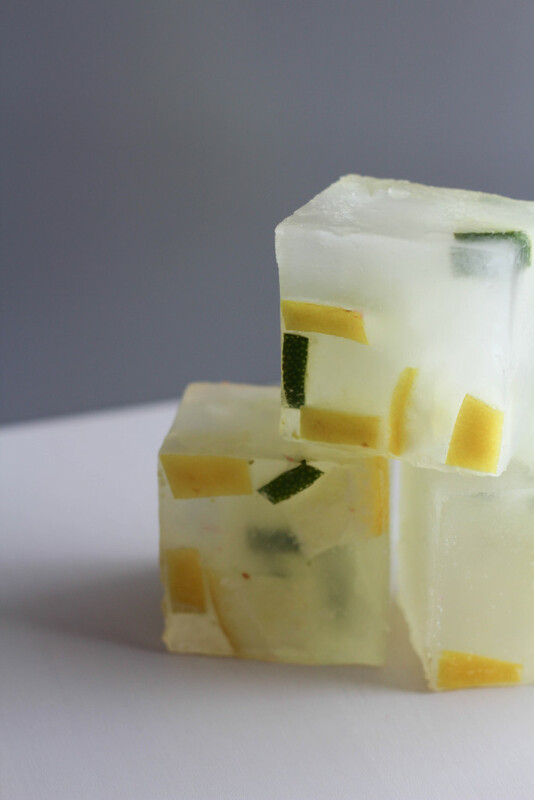 I cut both fruits into small wedges and then squeezed the juice from both into each cube space for added lemon/lime flavor. This colorful cube packs a punch. 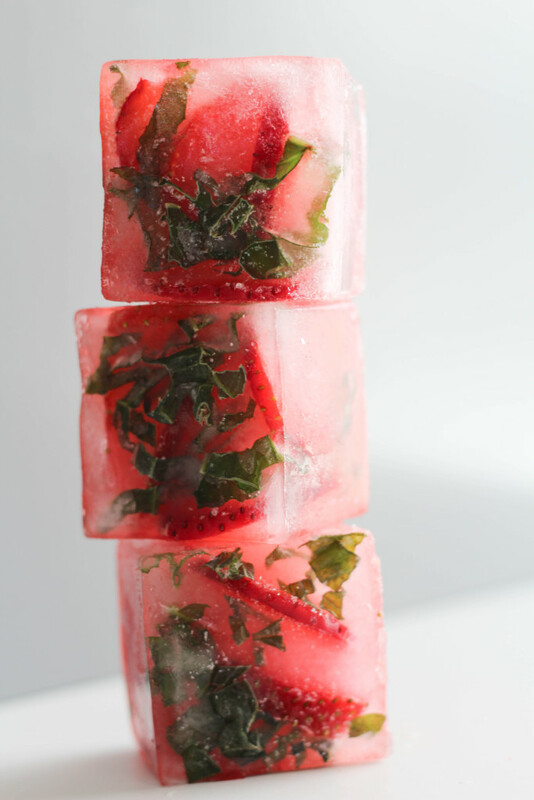 The combo of strawberry and basil might sound like a crazy combo but they are actually a great couple. The pair is like Summer in a glass. I sliced the strawberries and chopped the basil. 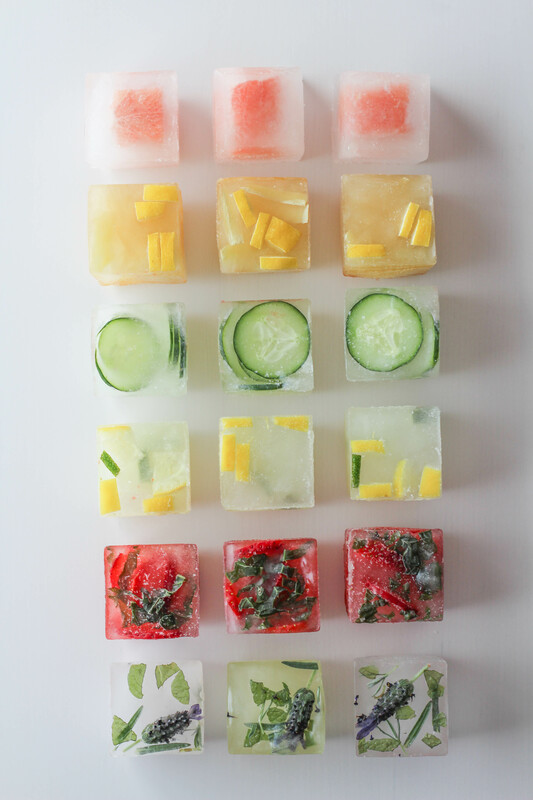 Add to your ice cube tray and let the ingredients shine! 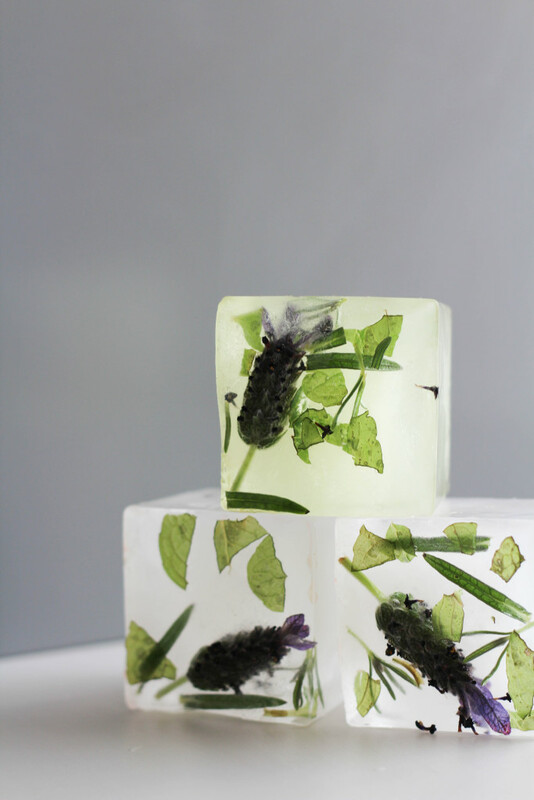 Lavender and mint pair up to give your water a fresh and floral flavor, perfect for Spring and Summer drinks. If lavender is in season, place a fresh bud right in your tray with fresh chopped mint. If you don’t have fresh lavender handy, you can also use dried lavender. 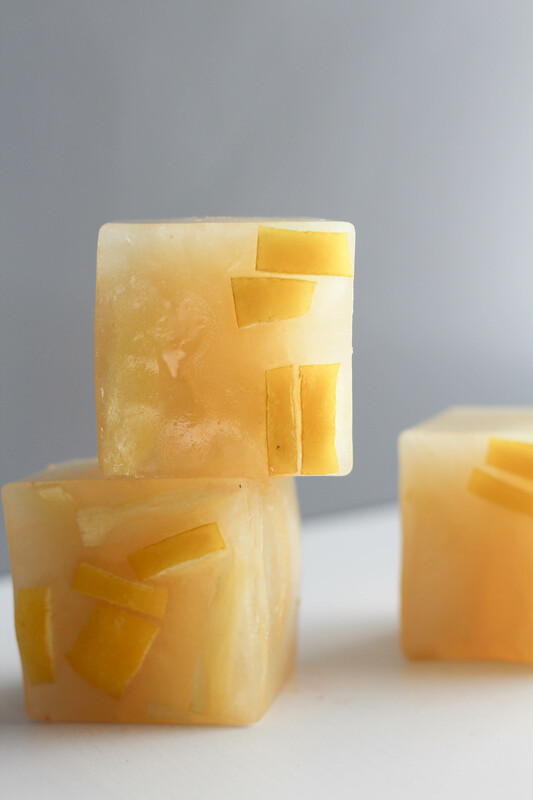 These cubes are really pretty when frozen and look just as great floating in your glass when the ice has melted. 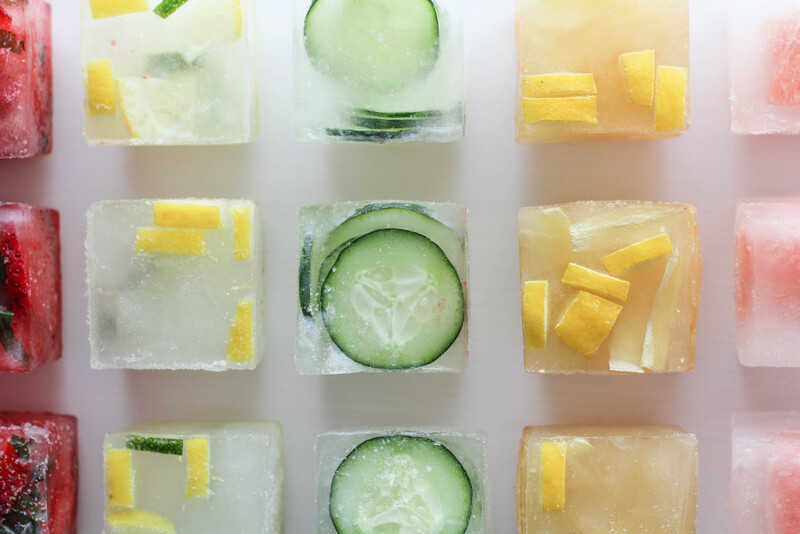 I’M GONNA TRY THESE GREAT IDEAS.I LOVE ALLOF THE DIFFERENT WAYS TO USE ICE .I HATE WATER ALSO. These are gorgeous! How far in advance can you make them? Will they still be nice and clear if I make them today for a gathering in five days? (I’m trying to minimize stress by doing what I can in advance.) Thanks! Emily, yes! You can definitely make them 5 days in advance and still have them look great! They should keep for quite a while, but after a bit they will start to form those lovely white little crystallization’s on them like normal ice cubes do. I used fresh leaves, picked from the plant the moment that I froze them, so, if possible, try to use the freshest leaves that you can to retain the color! Can you just put slices of oranges on your water in the morning will it still be the same…. 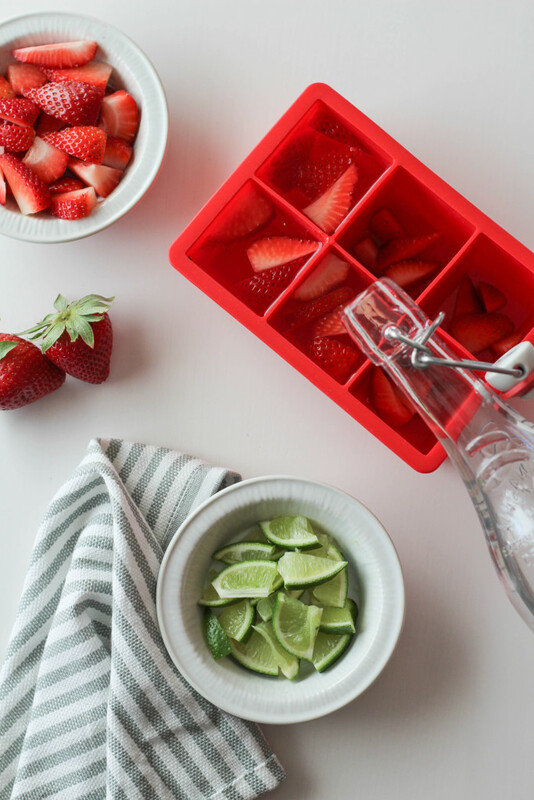 It won’t have the exact same effect as the ice cubes, but it will still flavor your water. You can also add lemon too! Adding fresh fruit into your water and letting it sit to soak up some flavor is a great way to amp up regular boring water! Try strawberries, watermelon, pineapple, blueberries, and melon too! Wait, you hate water?!? Humans are made up of 60% of the stuff. Gives new meaning to self-loathing! LOL! I know! I wish I loved it! Neat blog! Is your theme custom made or did you download it from somewhere? A theme like yours with a few simple tweeks would really make my blog jump out. Please let me know where you got your design. Thanks!